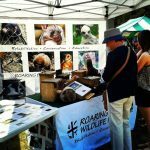 Wildcare Roaring Beach Wildlife Rescue is based on the Tasman Peninsula and focuses on rescue, rehabilitation, conservation and education in relation to native Tasmanian fauna. If you have injured wildlife in the Tasman Peninsula area we can assist. Conservation and education projects include habitat work in bushfire affected areas, wildlife rescue training for individuals and organisations and awareness campaigns within the community and local area. The group facilitated the first “Wildlife and Conservation Community Fair” in 2014 with over 400 visitors. Volunteers undertake animal rescue and transport, enclosure building and habitat regeneration work. We can also provide support should you wish to be trained as a registered wildlife carer with the Department of Primary Industries, Parks, Water and Environment.